Development Alternatives’ programmatic interventions have many levels of thematic impacts. The institutionalised systems strengthen the approach of the interventions and s ubsequently multiply the outcome of impacts. Let us discuss here the case of village Samrauli which had scarcity of water, low socio-economic strata and lack of information and community awareness. All these factors hampered the development of the village. Development Alternative’s systematic intervention in the past one and half years has significantly changed the scenario on the ground. While knowledge sharing was found to be the key for adoption of this development model, scarce natural resources especially water was found to be the biggest hurdle. 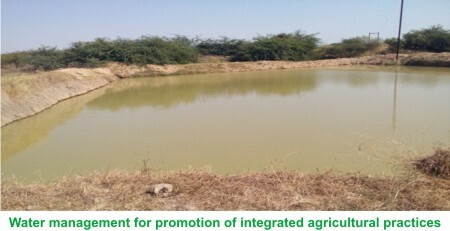 We came up with a sustainable approach in which water conservation was done through constructing small ponds and small water harvesting systems at the farm level. 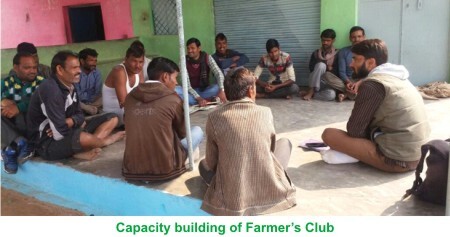 The intervention began with the formation of a farmer’s club in the village. Then, capacity building was done through training and exposure visits along with close interaction with the villagers. At first, 24 farmers having 90 households adopted an integrated farming model which includes agri-horti, floriculture, vegetable farming, fodder cultivation and cattle rearing along with conventional farming. The aim of the intervention was to make the model “feasible and replicable”. Vegetable cultivation became more prominent because of immediate returns. Availability of green fodder for the animals boosted the scope of cattle rearing as an additional source of income for the farmers. Initially, market to sell the produce became a problem but sharp community thinking and solution-oriented approach solved the problem quickly. About 4 km away from the village, there is a temple which has a huge demand for vegetables and milk. Taking this opportunity, the newly formed farmer’s club of the village approached the temple management and made a contract to provide vegetables and milk to them on a daily basis. The institutionalised system empowered the community enough through information exchange resulting in wider discussions on climate change and community health. The community realised their role in mitigating the impact of climate change and fulfilling the health concerns of children, lactating mothers and the elderly. Small efforts were made to contribute in the fight against climate change through promotion of vermi composting using cattle’s waste and adopting organic farming for vegetable cultivation. Availability of green fresh vegetables has made significant changes in the improvement of the community’s health.